First signs of the introduction of vines in the Beaujolais region can be traced back to the year 957. In Gaul, the implantation of vines followed the Roman legions on the axes that made up the Rhône and Saône valleys, and in certain localities these existed way beforehand. Up until the eighteenth century, the Gamay grape variety, a black grape with a white juice, was slowly developed on the hills of the Beaujolais region, traditionally devoted to the cultivation of cereals and the rearing of small breeds in response to the demand from the Lyons agglomeration. In the Middle-Ages, the capital was Beaujeu. Anne de Beaujeu, daughter of Louis XI, spouse of Louis de Bourbon and regent of France, will remain much attached to the economic development of her native region. The powerful Lords of Beaujeu, astute politicians and fearsome warriors, derived their wealth from the control they exercised on all commercial activity on the axis from the South up to the capital. A number of châteaux and fortresses were erected under their reign. … Between the Mâconnais and Côtes du Rhône regions. An undulating sea of vines along the hillsides and over the hills climbs up towards the sun basked mountains and slopes. 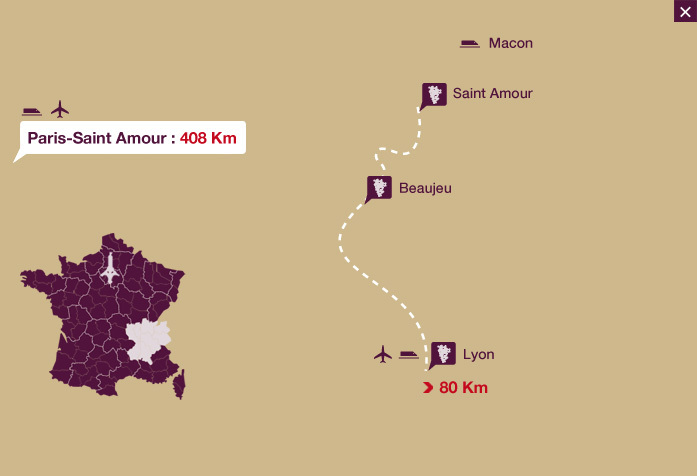 The Beaujolais vines stretch across 140 kilometres from Saint Amour to the gates of Lyons, crossing the ‘Pierres Dorées’ country, with landscapes comparable to those of Tuscany. Villages, golden stones, wash houses, natural water sources, vines, punctuated by typical ‘cadoles’ – old stone huts -, fairytale castles, glazed roofs, small roman churches… Discovering the landscapes of the Beaujolais by enjoying a country walk is a real pleasure – as is their wine! 19,000 hectares of vines, ten vintages besides the Beaujolais and Beaujolais-Villages are guaranteed vintages since the decree of 1937. The ground is such a mosaic, the consistency of which varies from one plot to another. Granitic, rich in minerals, shales, manganese, the Gamay prefers lean soil. Behind the beautiful name of Beaujolais lies the Gamay, a black grape with a white juice. This sole grape variety is handpicked and the subtle blends come from the soil mosaic and venerable vines. Each vintage proudly represents its particular village, asserts its native tang and reveals its true character. The Beaujolais offers a range of wines with a unique and seductive taste. Named Saint Amour, Brouilly, Chénas, the less known, Chiroubles, Côte de Brouilly, Fleurie, Juliénas, Morgon, Moulin à Vent, Régnié and then Beaujolais-Villages and Beaujolais, they are the twelve flagship vintages of the region. A small niche is developing, very on trend, with just a few vineyards planted with Chardonnay grapes, on richer, sandier ground to produce a white Beaujolais, with hints of pinot grape that flavour the wine, as well as rosés and sparkling wines, so-called traditionally made, these complete the range. It suits the Beaujolais region’s festive spirit and satisfies consumer taste. The name is also recognised abroad, when the terms Beaujolais and Nouveau are often associated. Fresh, spruce, a pleasurable wine, the latest vintage is easily drunk as early as November. It should not be overlooked however, that Beaujolais wines have the ability to improve with age and that the Fleurie, Brouilly, Moulin à Vent belong to the noble family. Many celebrities and those from illustrious families from Lyons come to find refuge in this peaceful region, with its combs and mountains dissimulating the great and beautiful stone-built residences. We can reveal that the cloister of the Bénédictines of Salles-Arbuissonnas once housed Alix des Roys, the mother of the poet Lamartine. Vaux en Beaujolais, also known as “Clochemerle”, thanks to the famous 1930s comedy written by Gabriel Chevalier, is one of most visited villages in France. It is still thought that the famous treasure of the Templars is hidden in the Artigny fortified castle at Charentay. The Marquise de Sévigné, a woman of letters and great taste, holidayed at the Château de Bagnols, a remarkable thirteenth century residence, since turned into a luxury hotel. The novelist Colette wrote some pages inspired from the grape harvests in the Beaujolais, whilst staying at the Château Thivin in 1947. The painter Utrillo came to enjoy the country air in the French gardens of the Château de Corcelles. Bernard Pivot was born in Quincy en Beaujolais. A vintage was named after him at the Quincy cooperative. A dominant figure in the literary world, passionate about wine and author of the Dictionnaire Amoureux du Vin, Bernard is a fervent defender of the wine from his native land. The Château de La Chaise, attributed to Mansart, welcomed the wives of heads of states, including Hilary Clinton, hosted by Bernadette Chirac on 28 June 1996 on the occasion of the G7 Summit that took place in Lyons. And it is the Château de Montmelas, with its fortified castle setting, that provided the backdrop to the TV series Kamelott.